LOS ANGELES – Ricardo Montalban, the Mexican-born actor who became a star in splashy MGM musicals and later as the wish-fulfilling Mr. Roarke in TV's "Fantasy Island," died Wednesday morning at his home, a city councilman said. He was 88. Montalban's death was announced at a meeting of the city council by president Eric Garcetti, who represents the district where the actor lived. Garcetti did not give a cause of death. This is sad news indeed. 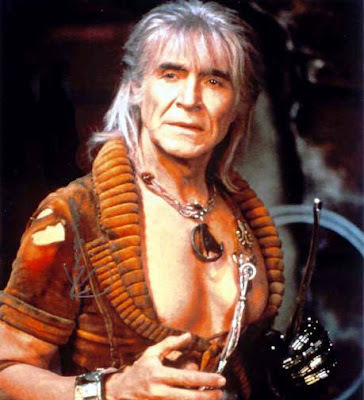 For legions of Star Trek fans, myself included, Montalban will always be remembered as Khan Noonien Singh, the memorable villain with the impressive pecs from Star Trek II: The Wrath of Khan, as well as the original series episode from which he originated, Space Seed. Somehow, the world just won't be the same without him. Rest in peace, Ricardo. You will be missed. Yes, Matthew I share your grief for him. That tuen in THE WRATH OF KAHN will always be unforgettable; i can just hear that mischievious voice in my mind.......R.I.P.